“Master Luiz Palhares is an 8th degree, Coral Red White Belt Under Grand Master Helio Gracie and Master Rickson Gracie. Luiz was born in Rio De Janeiro, Brazil, on January 19, 1959. He started training in Rio De Janeiro in 1977 at the age of 18 under Rolls Gracie and continued to train with him until Rolls died in 1982, in a hang-gliding accident. After Rolls’s passing, He continued to train under Rolls’s brother, Rickson Gracie. After 7 years of practicing BJJ, he was awarded his black belt in 1984 by Rickson Gracie together with Grand Master Helio Gracie. 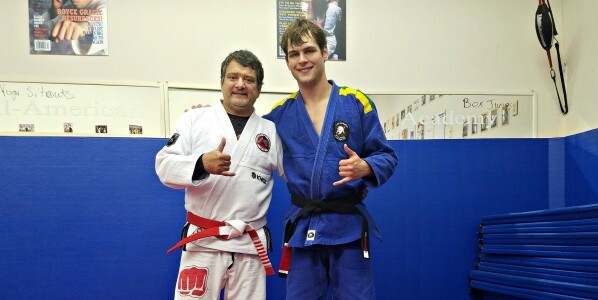 Luiz received his Coral belt in 2010 by Grand Master Carlos Robson Gracie, Red Belt 9th Degree (President of the Jiu-Jitsu Federation of Rio de Janeiro). In 1999, then a 6th-degree black belt, Luiz was asked to move from Brazil to teach at Rickson Gracie’s Academy in Los Angeles. Master Luiz currently resides in Jacksonville, FL, where he and his son, black belt Pedro Palhares, run Jacksonville Gracie Jiu-Jitsu.